​New links will be up soon! Being a percussionist in the Frost band program: *please read first!!! Percussionists that played in the sixth grade level have first priority of being in the percussion section. Many students get excited telling me that they play "drums" and want to be a percussionist. These students will be disappointing finding out that there is not any drum set playing. We do have drum set players in our Jazz Band, which is an audition based only ensemble. To be a member of the Frost Jazz Band, students must be in Concert Band 7th grade year, and audition at the end of 7th grade year, and must be a member of the Symphonic Band 8th grade year. Being a percussionist is a very important role to the band. It requires a lot of patience. (Winds/Brass have more playing time than percussion) Many students want to become a percussionists in 7th or 8th grade. If a student is an instrumentalist such as a brass or woodwind student, it is better to continue on an instrument in that family. These students must also be self independent and self motivators. Percussion students learn the skills to play Concert Snare Drum, Bass Drum, Timpani, Xylophone, Bells, Marimba, Crash Cymbals, Suspended Cymbals, Tambourine, Triangle, Concert Toms, and various Auxiliary Percussion. Students also must take care of the instruments in the classroom, clean and put away the instruments daily at the end of class. Percussion students must also have drum pads daily to warm up and practice on. Students will focus on learning rudiments, stick control and techniques that are used to perform the music in class. Percussion students will receive anywhere from four to nine + parts for each piece that we perform. These students are responsible for learning all parts. An example of one piece of music would include a March style piece (snare drum, bass drum, crash cymbals, timpani, and bells). The band director will assign percussionists the parts that they will be assign for each concert. Depending on how many percussionists are in the ensemble and the need of percussion for each piece, it is very likely that percussionists will only play 2 pieces if the band plays 4 pieces for a concert. - Before class starts, students may ONLY warm up on drum pad or mallet instruments (xlyophone, bells, marimba). - Percussionists need to clean, maintain all percussion instruments in the percussion section. Instruments must be put away at the end of class each day. • Practice pad/snare and bell kit for home practice and to bring to school for testing. 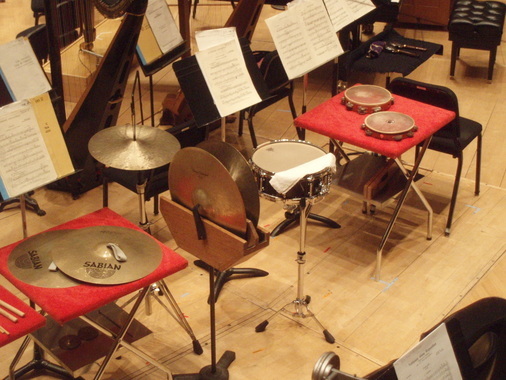 Through Steve Weiss Music for percussionists, any of these bell kits are acceptable for class. Click on the instrument to watch the video how to play the instrument. These videos are from Vic Firth website. Used for educational purposes only.